Glycogen is the key energy storage molecule in humans, animals and fungi. It’s where the glucose that fuels us is stored and release from. However, the precise mechanisms by which glycogen is formed at its very start have remained unclear until now. A recent study published in Nature uncovers how the enzyme that initiates glyconeogenesis works at a molecular level. The research was carried out by a team of computational biology from the University of Barcelona (UB), together with research groups of Chemical and Structural Biology of the University of Oxford. At the heart of the glycogen particle there is a protein that starts the glycogen formation catalysing its own autoglucosylation, that is, decorating itself with glucose molecules. This ‘self-sweetening’ protein - glycogenin - has been hard to understand since, by definition, as it is decorating itself it is also changing (and so its mechanism is ever-changing too). This seeming conundrum in basic human Biology and health has now been solved by using Chemistry – mediated by the unnatural metal palladium – to ‘jump start’ or ‘shunt' into these different decorated forms directly. 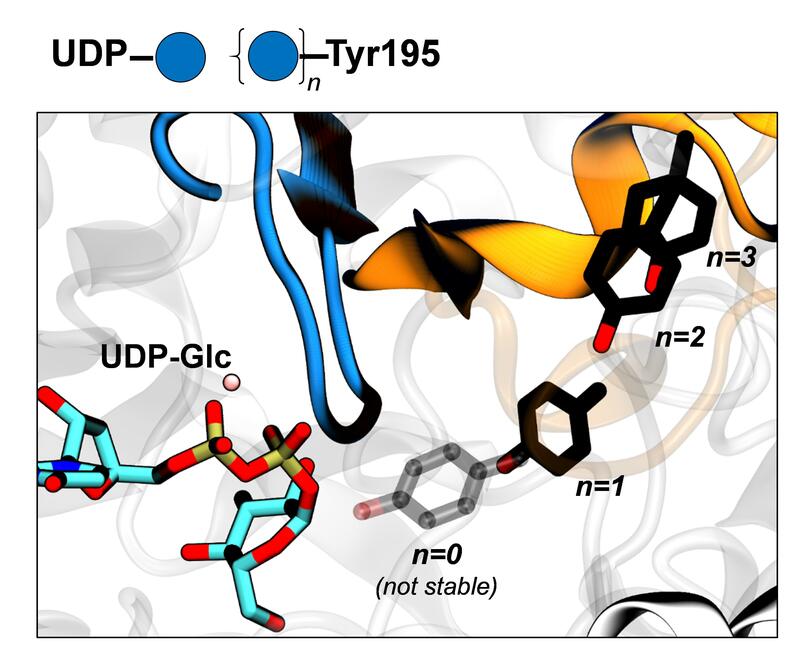 The researchers at the University of Oxford could access different states of glycosylation of the glycogenin enzyme through a palladium-mediated enzyme activation ‘shunt’ process using on-protein C–C bond formation. The UB team, using computational techniques, has modelled these states and has deciphered the mechanism of glycosylation (synthesis of glucose-glucose bonds) through methods of quantum mechanics and molecular dynamics. Both experiments and calculations reveal a surprisingly tolerant process to glycogen’s creation and growth, which then become very precise as it goes on. This new of way of ‘jumping’ into different states of Biology using Chemistry suggests a new way of understanding and even programming Biology directly. Motion of Tyr195 to accommodate acceptor substrates of various lengths, obtained from molecular dynamics simulations of wild type glycogenin. Glucose units in the acceptor substrates have been omitted for clarity. Bilyard MK, Bailey H, Raich L, Gafitescu M, Machida T, Iglesias-Fernández J, Lee SS, Spicer CD, Rovira C, Yue WW & Davis BG 2018, 'Palladium-mediated enzyme activation suggests multiphase initiation of glycogenesis', Nature, 563, 235-240. To cope with increased food demand, crop yields must increase substantially within the next 2–3 decades. This must be achieved in a context in which crop management should be environmentally more sustainable, and when crops will be more frequently exposed to stressful conditions penalising their yields due to climate change. Deleterious effects of heat on crop yields are well documented and the occurrence of heat stresses will likely be a major constraint to achieving increased yields. Nitrogen (N) fertilization is within the most common management practices used in cereal production, however, there have been limited efforts to elucidate to what degree the level of soil fertility may affect the magnitude of the heat effect on crop yield. The likely interaction may be relevant for designing more appropriate fertilisation strategies. 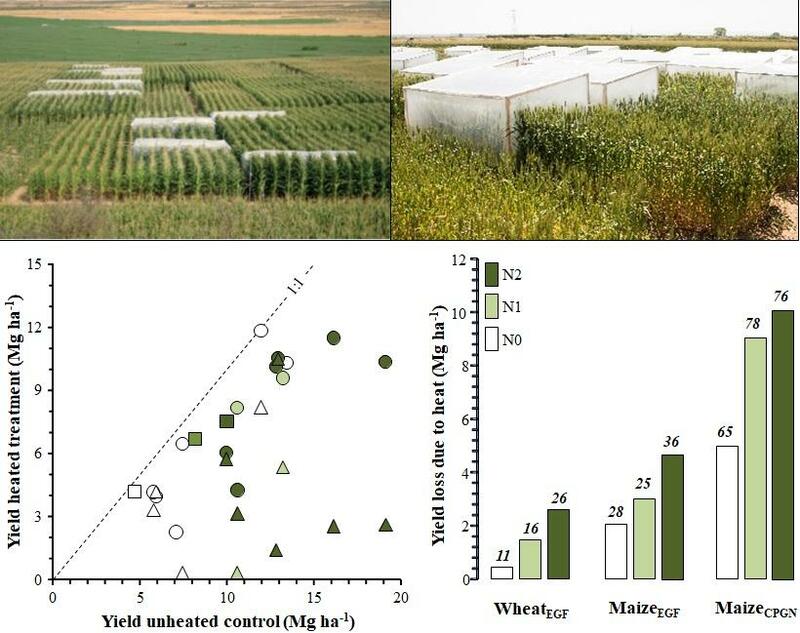 We conducted different studies on maize (2009–2012) and wheat (2012–2013), always under field conditions, to determine whether the availability of N may be responsible for the magnitude of the yield penalty imposed by heat stress. We showed for the first time that sensitivity to heat stress increased with increasing N availability and speculated that moderate N stress might produce in the crop plants a sort of acclimation to reduce sensitivity to other stresses. Fertilisation recommendations in the future may need to balance the yielding benefits of high N availability with the detrimental effect of increasing sensitivity to heat stress. Slafer GA & Savin R 2018, 'Can N management affect the magnitude of yield loss due to heat waves in wheat and maize? ', Current Opinion In Plant Biology, 45, B, 276 - 283. Large amounts of waste heat generated in our fossil-fuel based economy can be converted into useful electric power by using the so-called thermoelectric generators. These power generators use temperature differences to generate electricity in a very simple and straightforward way. However, the low-efficiency, high-cost and scarcity of conventional thermoelectric materials are hindering a massive deployment of this energy harvesting technology to recover residual heat. Nanoengineering has proven to be an excellent approach for enhancing thermoelectric properties of abundant and cheap materials such as Silicon. Nevertheless, the implementation of these nanostructures is still a major challenge especially for covering the large areas required for massive waste heat recovery, for instance, at the industry level. We have been working in developing a novel family of nano-enabled silicon-based materials in the form of large-area paper-like fabrics made of nanotubes. Our recent paper in Nature Communications presents this as a cost-effective and scalable solution for thermoelectric generation opening new markets with a potential for recovery up to 15TW of currently wasted power. The image shows a cross-section Scanning Electron Microscopy picture of our thermoelectric fabric made of Silicon nanotubes. This is how our new nanomaterial looks like from inside! Morata A, Pacios M, Gadea G, Flox C, Cadavid D, Cabot A & Tarancón A 2018, "Large-area and adaptable electrospun silicon-based thermoelectric nanomaterials with high energy conversion efficiencies", Nature Communications 9, 4759. We analyzed protein-RNA networks and identified properties of RNA attracting proteins in large assemblies. 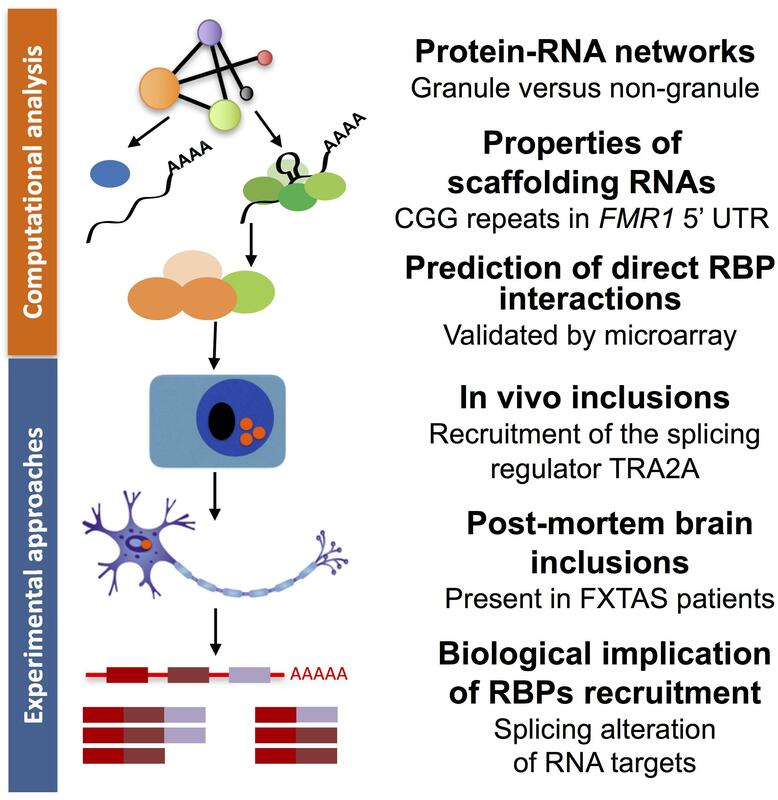 We found that trinucleotide repeats in the FMR1 gene attract several proteins including the splicing factor TRA2A that aggregates in Fragile X-associated Tremor/Ataxia Syndrome (FXTAS). We used theoretical and experimental approaches to study which RNAs attract a large amount of proteins. We were surprised to find that our predicted interactions work as biomarkers for a neurodegenerative disease, Fragile X Tremor Ataxia Syndrome. It was particularly exciting that we detected the TRA2A protein in the brains of people with the disease – it is one of the most important findings of our research. Cid-Samper F, Gelabert-Baldrich M, Lang B, Lorenzo-Gotor N, Ponti RD, Severijnen LWFM, Bolognesi B, Gelpi E, Hukema RK, Botta-Orfila T, Tartaglia GG 2018, 'An Integrative Study of Protein-RNA Condensates Identifies Scaffolding RNAs and Reveals Players in Fragile X-Associated Tremor/Ataxia Syndrome', Cell Rep. 25(12):3422-3434.e7. Pulsars are dense, magnetic relics of massive stars, and are amongst the most extreme objects in the Universe. Originally detected through their radio emission, pulsars are now known to also emit other types of radiation. Some of this emission is standard thermal radiation – the type that everything with a temperature above absolute zero emits. But in pulsars, non-thermal radiation can also be created by synchrotron emission and curvature emission. Both processes involve charged particles being accelerated along magnetic field lines, causing them to radiate light that can vary in wavelength from radio waves to gamma-rays. This year, Torres developed a model that combined synchrotron and curvature radiation to predict whether pulsars detected in gamma-rays could also be expected to appear in X-rays. Despite the extreme precision of the observations, and the underlying complexity of the processes involved, just four physical parameters suffice in his model to fit the spectrum of all gamma and/or X-ray pulsars known, disregarding whether they are normal or millisecond pulsars, detected in X-rays or gamma-rays or both. When analyzing the fits for all pulsars, relevant correlations of the model parameters appear, explaining the different observational behaviors. This model answers at once what process is behind the emission spectra and how the spectral variety arises. It explains intricacies such as why we have detected flat spectra at low and high energies. And it provides a predictive tool by which to identify new X-ray pulsars. Torres also partnered with a team led by his former postdoc Jian Li, to select three gamma-ray emitting pulsars that they expected, based on the model, to shine in X-rays. Not only did they detect X-ray pulsations from all three of the pulsars searched, but they also found that the spectrum of X-rays was as predicted. This discovery already represented a significant increase in the total number of pulsars known to emit non-thermal X-rays and help us better comprehend the interaction between particles and magnetic fields in pulsars and beyond. This text is based on ESA, ICE, Athena, INTEGRAL, and CSIC press releases. 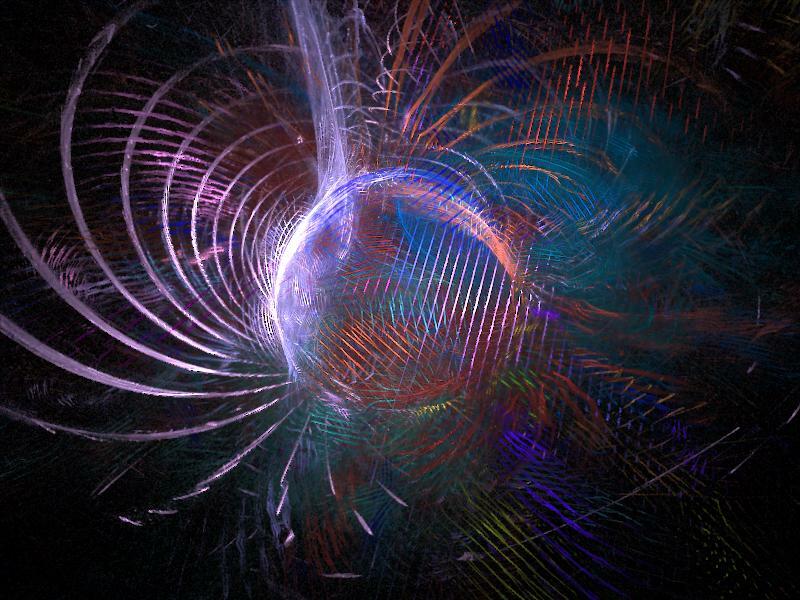 A fractal flame, artistic representation of a pulsar magnetosphere. Torres DF 2018, 'Order parameters for the high-energy spectra of pulsars', Nature Astronomy, 2, 3, 247 - 256. Li J, Torres DF, Coti ZF, Papitto A, Kerr M & Rea N 2018, 'Theoretically Motivated Search and Detection of Non-thermal Pulsations from PSRs J1747-2958, J2021+3651, and J1826-1256', The Astrophysical Journal Letters, volume 868, issue 2, article id. L29, 7 pp. One of the most enviable features of superheroes is their ability to stretch their bodies beyond imaginable limits. In this study we discovered that our cells can do just that. Together with the team led by Marino Arroyo (UPC), we developed a new approach to subject epithelial tissues – the thin cellular layers that cover internal and external surfaces of the body – to very large deformations, up to four times their original size. 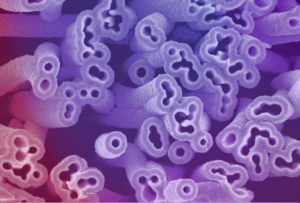 These cellular layers are fundamental to life, as they protect the body from radiation, pollutants and pathogens. They’re also responsible for gas exchange in the lungs, absorption of nutrients in the gut, and excretion of urine in the kidneys. Most materials are unhappy during stretching. As they become progressively deformed, they’ll want to go back to their unstretched state, like a rubber band, or may even break as the tension increases. We found that epithelial sheets have a different and unusual mechanical behavior. To our surprise, tissues did not break during stretching, and they were able to recover their initial size in a fully reversible way when unstretched. Even more surprisingly, some cells in the tissue barely stretched, while others became ‘superstretched’, increasing their area more than ten times. We identified the molecular mechanisms that explain this physical behavior, which we call ‘active superelasticity’ as an analogy with the behavior of some high-tech metal alloys used in medical technologies. As cells become stretched, they become equally happy in an unstretched state or in a super-stretched state. As a result, these cell sheets can deal with increasing stretch by progressively switching cells into their super-stretched state without increasing tension, which would otherwise compromise integrity or cohesion. Understanding this surprising mechanical behavior in epithelial tissues could help us build better artificial organs or new bionic technologies such as organs-on-a-chip. 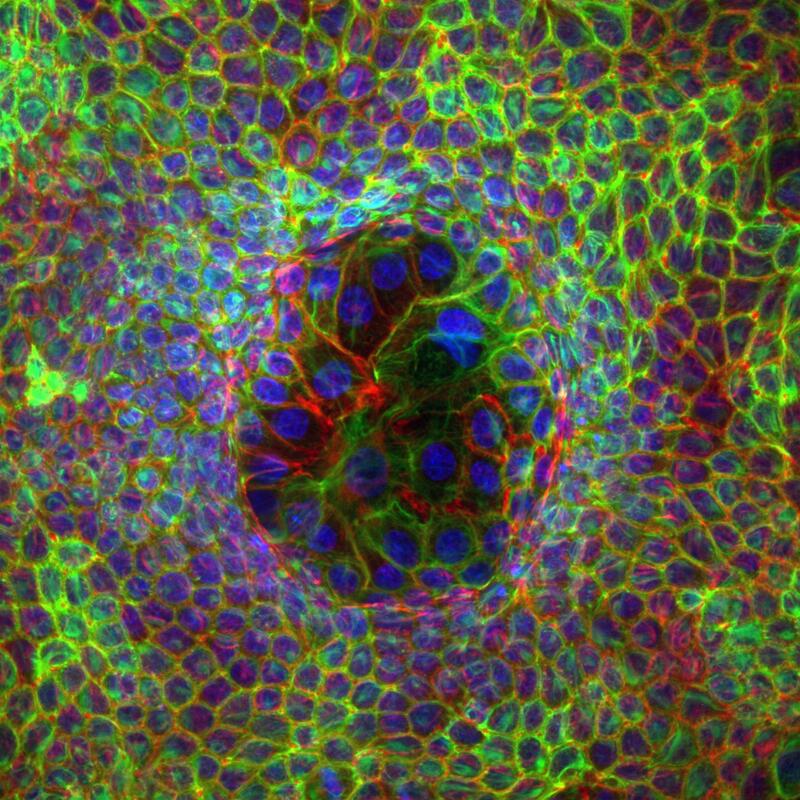 Super-stretched cells surrounded by only slightly deformed ones. The cell nucleus is shown in blue, actin filaments in red, and keratin filaments in green. Latorre E, Kale S, Casares L, Gómez-González M, Uroz M, Valon L, Nair RV, Garreta E, Montserrat N, Del Campo A, Ladoux B, Arroyo M & Trepat X 2018, 'Active superelasticity in three-dimensional epithelia of controlled shape', Nature, 563(7730):203-208.